Cement kilns are used by the cement industry in the production of cement. Portland cement, used in almost all construction applications, is the industry's primary product. Essentially all of the NO2, emissions associated with cement manufacturing arse generated in the kilns because of high process temperatures. To make cement, raw materials such as limestone, cement rock, sand, iron ore, clay and shale are crushed, blended and fed into a kiln. These materials are then heated in the kiln to temperatures above 2900°F to initiate a chemical reaction (called "fusion") that produces cement "clinker," a round, marble-sized, glass-hard material. The clinker is then cooled, mixed with gypsum and ground to produce cement. 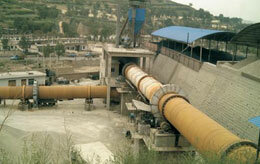 Nearly all cement clinker is produced in large rotary kiln systems. The rotary kiln is a refractory bricklined cylindrical steel shell equipped with an electrical drive to turn it at 1-3 rpm, through which hot combustion gases flow countercurrently to the feed materials. The kiln can be fired with coal, oil, natural gas, waste or a combination of these fuels. Currently, most cement plants (over 75 percent) are coal-fired. There are four types of kilns in use - long wet kilns, long dry kilns, kilns with a preheater and kilns with a precalciner. The long wet and dry kilns and most preheater kilns have only one fuel combustion zone, whereas the newer precalciner kilns and preheater kilns with a riser duct have two fuel combustion zones. In a wet kiln, the ground raw materials are suspended in water to form a slurry. In a dry kiln, the raw materials are dried to a powder. Newer cement plants normally use the dry process because of its lower energy requirement. Because the typical operating temperatures of these kilns differ, the NO2 formation mechanisms also differ among these kiln types. In a primary combustion zone at the hot end of a kiln, the high temperatures lead to predominantly thermal NO2, formation. 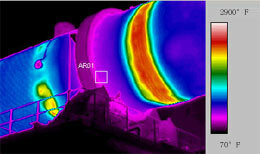 In the secondary combustion zone, however, lower gas-phase temperatures suppress thermal NO2 formation. Energy efficiency is also important in reducing NO2 emissions; for example, a high thermal efficiency means less heat and fuel are consumed and, therefore, less NO2 is produced.